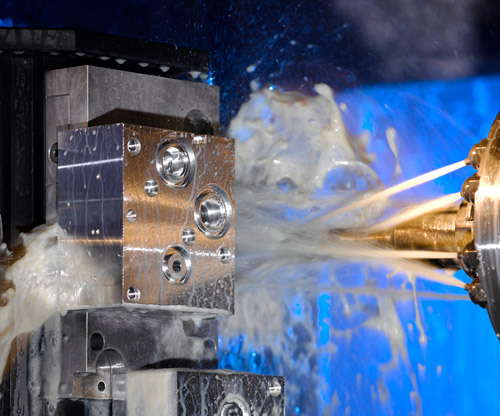 Providing precision machining and turning capabilities, California Brazing is equipped with a complete, state-of-the-art machine shop offering comprehensive aerospace CNC machining services. Our fully equipped defense/aerospace machine shop is just one part of our component assembly development and turnkey contract manufacturing program, designed to help streamline our client’s various manufacturing processes, while reducing costs, improving quality, and providing quicker turnaround times. Our expert staff works directly with our aerospace and semiconductor clients to develop a customized production plan that meets precise customer requirements. Additionally, we document every aspect of the project from start to finish, ensuring consistently superior results every time we complete an assignment. Our precision machining and turning equipment can work with a broad array of materials, ranging from stainless steel and copper to titanium and aluminum. California Brazing is equipped with only the most advanced machinery, guaranteeing optimal performance, quicker deliveries, and exceptional results. Contact our company today for more information about our aerospace machine shop and specialized semiconductor equipment machining and turning services!